November is recognized as Diabetic Eye Disease Month, a campaign created to raise awareness of the eye-related complications faced by people with diabetes. At Elman Retina Group, our ophthalmologist, Dr. Michael J. Elman, has over 30 years of experience helping individuals treat and manage retinal conditions, including those brought on by diabetes. Here, our team shares important information on diabetic eye disease. People with diabetes are faced with a slew of health problems and difficulties as a result of uncontrolled levels of blood sugar. High levels of blood sugar can damage the tiny blood vessels of the eye, including those that nourish the retina. If the blood vessels in the retina swell or leak blood or fluid, it can lead to diabetic retinopathy, the most common diabetic eye disease. The American Diabetes Association estimates that more than 30 million Americans have diabetic retinopathy, which, if left untreated, can cause permanent vision loss and even blindness. A consequence of diabetic retinopathy is diabetic macular edema, which occurs as a result of fluid buildup in the macula (the central part of the retina responsible for sharp vision). Approximately half of all individuals with diabetic retinopathy are diagnosed with diabetic macular edema. In addition, diabetics are twice as likely to develop glaucoma (a condition that can lead to blindness due to increased pressure within the eye) and five times more likely to develop cataracts (clouding of the eye’s natural lens). If you have diabetes, it is critical that you manage your blood sugar levels in order to minimize your risk of diabetic eye disease. This includes taking your diabetic medications as prescribed, maintaining a healthy weight by eating a well-balanced diet, and exercising regularly. In most cases, diabetic eye diseases do not exhibit noticeable symptoms until significant and sometimes irreversible damage has occurred to the eye. 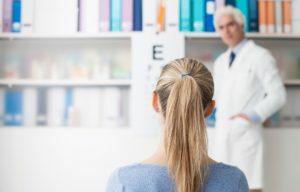 For this reason, diabetics should have annual dilated eye exams with a board-certified ophthalmologist or retina specialist. These exams are key in detecting early signs of eye disease, when symptoms are more easily treatable. Elman Retina Group is committed to helping you enjoy a lifetime of healthy vision. To learn about the treatment options we offer for diabetic eye disease, or to schedule a comprehensive eye exam with Dr. Elman, please call (410) 686-3000 or email our office today.